Summary and Definition: The MLK Assassination shocked the world and sent the nation into mourning. Martin Luther King, Jr. was the most famous leader of the Civil Rights Movement and his policy of peaceful protests led to his being awarded the Nobel Peace Prize for leading non-violent demonstrations. James Earl Ray, a small-time criminal and confirmed racist, was convicted of the assassination of Martin Luther King, Jr. on March 10, 1969, after entering a guilty plea to forgo a jury trial to avoid being eligible for the death penalty. The MLK Assassination effectively ended the Civil Rights Movement of the 1960's. The life of this famous man is honored each year on Martin Luther King day, the third Monday in January. Lyndon B Johnson was the 36th American President who served in office from November 22, 1963 to January 20, 1969. One of the important events during his presidency was the MLK Assassination. The following fact sheet contains interesting facts and information on MLK Assassination. MLK Assassination Facts - 1: Martin Luther King, Jr. received his doctorate degree in theology in late 1955, and moved to Montgomery, Alabama, with his wife, Coretta Scott King, to preach at a Baptist church. MLK Assassination Facts - 2: In 1955 Dr. Martin Luther King Jr. became the president of the Montgomery Improvement Association which was established following protests against the incident involving Rosa Parks which began the Montgomery Bus Boycott. MLK Assassination Facts - 3: In 1957 MLK became president of the Southern Christian Leadership Conference (SCLC) which aimed at eliminating the practice of segregation and to encourage African Americans to exercise their Civil Rights and register to vote. MLK Assassination Facts - 4: Dr. Martin Luther King Jr. became a leader of the Civil Rights movement and supported peaceful demonstrations such as the lunch counter sit-ins that started in Greensboro, N.C. and went on to support the protests of the 1961 Freedom Riders to desegregate education and transport facilities. MLK Assassination Facts - 5: In the spring of 1963 MLK led Civil Rights protests in Birmingham, the most thoroughly segregated city in the United States. The protests of the Birmingham Campaign led to the arrest of MLK on April 12, 1963 for violating an anti-protest injunction against mass public demonstrations. During his imprisonment he wrote his Letter from Birmingham Jail. MLK Assassination Facts - 6: MLK went on to achieve world wide fame and recognition for his emotive "I have a dream" speech at the March on Washington for Jobs and Freedom on August 28, 1963. MLK Assassination Facts - 7: He was instrumental in bringing about great changes in Civil Rights legislation when he met with President Kennedy who gave his full support to the civil rights movement and subsequently sent a comprehensive civil rights bill to Congress on June 19, 1963 banning segregation and discrimination based on race, nationality, or gender. MLK Assassination Facts - 8: The world was shocked when President Kennedy was assassinated in Dallas, Texas, on November 22, 1963 - refer to the JFK Assassination. MLK Assassination Facts - 9: President Lyndon B. Johnson approved of the Kennedy civil rights bill and played a major role in supporting the Civil Rights Act of 1964 which was signed into law on July 2, 1964. MLK Assassination Facts - 10: In 1964, MLK was awarded the Nobel Peace Prize for leading non-violent demonstrations. 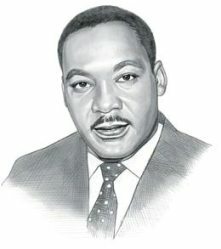 MLK Assassination Facts - 11: The Civil Rights Movement had gained significant victories but the organization had become fragmented into different organizations as many young black Americans became impatient with the non-violent protests of Dr. Martin Luther King and began to support the idea of Black Power. MLK Assassination Facts - 12: MLK denounced the militant Black Power movement and their the revolutionary message but young African Americans became increasingly interested in the black-only religion and organization known as the Nation of Islam. MLK Assassination Facts - 13: Malcolm X, like many other Civil Rights activists, were inspired by the beliefs of Elijah Muhammad and joined the Nation of Islam. Malcolm X broke with the Black Muslims and the nation was again shocked at another murder when Malcolm X was assassinated on February 21, 1965 by Nation of Islam members. MLK Assassination Facts - 14: Dr. Martin Luther King, Jr. continued with his peaceful protests and led the Selma March on 25 March 1965 which directly resulted in the Voting Rights Act of 1965 passing into law less than five months following the protest march. MLK Assassination Facts - 15: ‎Between ‎August 11, 1965 - August 17, 1965 the nation reeled at the Watts Riots in Los Angeles that resulted in 34 deaths, over 1,000 injuries, the destruction of property valued at $40 million and nearly 4,000 arrests. MLK Assassination Facts - 16: During the 1960's the Ku Klux Klan had re-emerged in opposition to the Civil Rights movement. White supremacists were infuriated by the race riots and organizations such as the Black Panthers who advocated the strategy of violent revolution by African Americans. MLK Assassination Facts - 17: Throughout the history of the United States, race had been used by whites for legitimizing social, economic and political exclusion. The white supremacists attracted new members to their organizations in the 1960's and their aims, supported and given credence by prominent political leaders in the southern states, appealed to men like James Earl Ray. MLK Assassination Facts - 17: James Earl Ray was particularly interested in the George Wallace presidential campaign in which Wallace supported "law and order" and racial segregation. MLK Assassination Facts - 18: James Earl Ray was a small-time criminal and confirmed racist. He was born on March 10, 1928, Alton, Illinois and spent his life as a petty criminal and drifter. MLK Assassination Facts - 19 In April 1967, James Earl Ray escaped from Missouri State Prison, where he was serving 20 years for armed robbery. He traveled around cities as Los Angeles, Chicago, Birmingham and Atlanta. MLK Assassination Facts - 20: A year later, on the afternoon of April 4, 1968, James Earl Ray posing as John Willard, rented a room at a Memphis rooming house near the Lorraine Motel, where Dr. Martin Luther King, Jr. was staying. The following fact sheet continues with facts about MLK Assassination. MLK Assassination Facts - 21: Dr. Martin Luther King, Jr, had traveled to Memphis, Tennessee, to lead a march in support of striking sanitation workers. During this time MLK was planning a national “Poor People’s Campaign” to promote economic advancement for all impoverished Americans. MLK Assassination Facts - 22: MLK, and his party were staying at the Lorraine Motel, near the waterfront area of Memphis, Tennessee. He was sharing room 306 with his associate, Reverand Ralph Abernathy. MLK Assassination Facts - 23: The night before his assassination, on April 3, 1968, MLK had told a church gathering "I’ve been to the mountaintop...I’ve looked over and I’ve seen the Promised Land. I may not get there with you, but I want you to know tonight that we as a people will get to the Promised Land." Some say this was a premonition of his death. MLK Assassination Facts - 24: On the evening of April 4, 1968, MLK was standing on the balcony of his room. At 6:01 p.m. Dr. Martin Luther King, Jr was struck by a bullet shot by a sniper and was mortally wounded. MLK Assassination Facts - 25: Dr. King was taken to St. Joseph Hospital where he was pronounced dead. His body was taken to Gaston Hospital, where an autopsy was performed by Dr. Jerry T. Francisco, the Shelby County medical examiner. MLK Assassination Facts - 26: Dr. Francisco's report on the autopsy concluded that Dr. King's death was the result of a single "gunshot wound to the chin and neck with a total transaction of the lower cervical and upper thoracic spinal cord and other structures of the neck.". MLK Assassination Facts - 27: The assassination of Dr. Martin Luther King, Jr, shocked and horrified the world. The country went into national mourning and riots broke out in more than 100 cities. MLK Assassination Facts - 28: Shortly after the fatal shot had been fired, witnesses saw a man believed to be James Earl Ray fleeing from a rooming house across the street from the Lorraine Motel. MLK Assassination Facts - 29: It transpired that James Earl Ray headed for Toronto in Canada, where he hid out for over a month and acquired a Canadian passport under the false name of Ramon George Sneyd and made his way to London. MLK Assassination Facts - 30: James Earl Ray was arrested at London's Heathrow Airport on June 8, 1968 and was extradited to the United States. MLK Assassination Facts - 31: James Earl Ray was convicted of the assassination of Martin Luther King, Jr. on March 10, 1969. On the advice of his lawyer he entered a plea of guilty in order to forgo a jury trial to avoid being eligible for the death penalty. He was sentenced to 99 years in jail. MLK Assassination Facts - 32: Three days later, on March 13, 1969, James Earl Ray recanted his confession. MLK Assassination Facts - 33: He escaped from Brushy Mountain State Prison with five other inmates on June 10, 1977, but was quickly recaptured on June 13, 1977. MLK Assassination Facts - 34: On August 16, 1978 James Earl Ray testified before the Select Committee on Assassinations of the U.S. House of Representatives. On December 30, 1978 the committee concluded that Ray acted alone but there was circumstantial evidence of a conspiracy. MLK Assassination Facts - 35: Jesse Jackson and James Lawson meet with Ray and his attorney, Mark Lane on August 10, 1979 and concluded that they did not believe that James Earl Ray had killed Martin Luther King, Jr.
MLK Assassination Facts - 36: In 1997, MKK's son Dexter met with Ray and the King family supported Ray's effort to get a new trial. MLK Assassination Facts - 37: James Earl Ray died from cirrhosis of the liver at the Columbia Nashville Memorial Hospital on April 23, 1998, at the age of 70. MLK Assassination Facts - 38: In the 1980's Dr. King’s widow, Coretta Scott King, together with congressional leaders and citizens petitioned the President to make January 15, Martin Luther King Jr.’s birthday, a legal holiday. MLK Assassination Facts - 39: In 1986, President Ronald Reagan declared the third Monday in January a federal holiday in honor of Dr. Martin Luther King, Jr. The Martin Luther King day is the only federal holiday to commemorate the life and achievements of an African-American. MLK Assassination Facts - 40: The assassination of Martin Luther King Jr. marked the end of the Civil Rights movement but under his leadership it had transformed American society.